I’ve had a difficult week with pressing deadlines at work and really low energy. But, I found time to get outside into the yard last night and tonight. Last night was all about weeding. The plentiful rain has helped many weed seeds germinate fairly quickly. I focused on the veggie beds last night for only about an hour, which was all the time I could muster up energy for. Tonight, I just cut some lettuce for tomorrow’s lunch, and took in the spectacle. 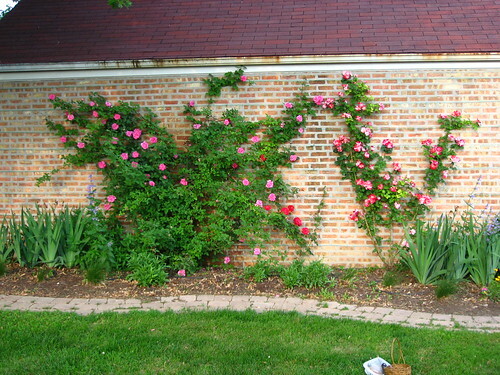 The first photo is of my “wall o’ roses” in it’s full glory: all three varieties are displayed. (Forgive the weeds; I haven’t gotten to that part of the yard yet.) 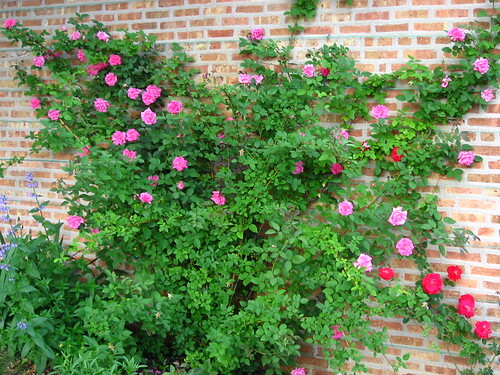 But this last photo with the pink roses is of my new love: Zephirine Drouhin. I picked this rose variety up at the Chicago Botanic Garden sale about 3 years ago. 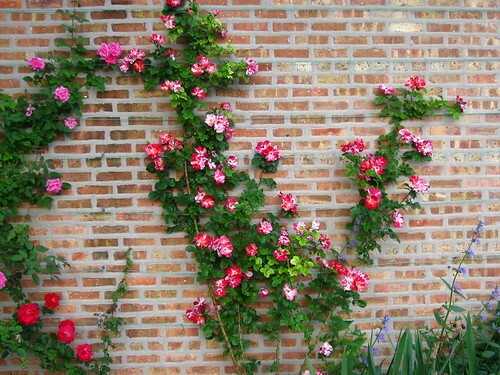 It sounded wonderful: a climber with no thorns that provided scented blooms even in part shade. For the past two seasons it has been a vigorous grower, but the blooms have been few and far between. Last year, I recall getting 2 measly blooms on the entire, humongous plant. But this year…ah…this year she has finally found her stride. This wall of my garage is very visible to my neighbors. They have commented to me how incredibly beautiful the roses are this year. My neighbors directly next door are an elderly couple, and the husband is very ill. He doesn’t even make it outside anymore, but his wife said he was sitting on their three-season porch in the back, looking out the window and commented how beautiful the roses were this year. I’m glad they brought him pleasure, too. Well, this past week was great if you’re a plant. We’ve had rain and high humidity nearly every day for the past week. While there’s been no need to water the garden, it has been difficult to do general maintenance chores like weeding when it’s this wet and generally icky outside. My garden is filling out very well now, but the weeds are sprouting up all over, too, and need to be managed before they get out of hand. Just a couple weeks ago the maple tree in the backyard dropped all of its samaras [Isn’t that a great word? That’s what all those little whirligig/helicopter seed pods are called: samaras.] so we have many exuberant little maple trees sprouting up in the oddest places. At least the roses are really popping right now. I’m quite happy that the Zephirine Drouhin has finally settled in enough after 3 years to toss off multiple scented, pink blossoms; in past years, I’ve only gotten one bloom each year from this climber. The wall o’roses along the garage is definitely looking mighty fine, and if I can actually get out there with a camera and not get drowned in precip or my own juices in the process I’ll take a few photos. Last Sunday I finished planting all of my pots, and with the blessings of rain we’ve received this week every one of them is growing/sprouting very well. I’ve decided to use pots not just for ornamentals this year. I nestled some big pots (a few “recycled” from shrubs and things I’ve planted in the past few years) down into the mulch to help retain water, and planted them with herbs (parsley, basil, epazote, and rosemary) and a few veggies. I have two pots of slicer cucumbers, two pots of zucchini, and 2 pots of icebox watermelons. Yep, I’m growing watermelons this year! This is my grand experiment plant and it will be quite exciting if it turns out well. Yesterday I found time for some outdoor fun in the early morning before the weather turned unbearably humid and rainy. Betsy and I went out to the Morton Arboretum for a little tour and then brunch at Dali’s Cafe in Downers Grove. I had never been to the Morton Arboretum before (shocking, I know! ), so during this visit I was just barely able to get an idea of the grand size of the place. Everything was so green and lush; it would have been great to spend more time, but I knew I needed to get back into the city during the early afternoon so we had to leave after a couple hours. We’re still living without a TV and coping quite well. I think I miss viewing the local news the most. We had an exciting Saturday afternoon/evening here in Chicagoland with some strong storms moving through. I was listening to the radio and as soon as I heard them say that a tornado was spotted moving through the south suburbs, I immediately thought about Adrienne and had to check in on her. She was already in the basement, eagerly waiting for the all-clear. (If she had thought to bring some knitting down with her to keep her company, maybe she wouldn’t have been so cranky about having to spend an hour in the basement!) Here we just had lots and lots of wind and heavy rain. The TV should be fixed at the end of this week, so we will once again be able to rent DVDs and spend endless hours watching mindless entertainment. In the meantime, I’m continuing to plug away at listening to my huge backlog of podcasts and enjoying this simpler pace. Maybe we’ll continue to spend some days completely TV-less….nah, with the election season heating up this fall, I’m certain Mark will be glued to CNN and MSNBC in every waking moment.